it’s beginning to look alot like there won’t be any christmas brouhaha around these parts. yay! there was talk of a tree. very small, sarcastic talk about my “stick tree” and that, was that. no one has the energy to actually take action and that’s fine with me. the house is kind of out of our control at the moment and that’s fine with me too. baby things everywhere, yarns, fabrics, laundry. i tidy up every now and again but the mess builds up right behind me. i am embracing the mess. little Kable guy is growing right before our eyes and even we who cannot tear our eyes away from him can see it happening. it really is like falling in love. that’s what the midwife told me having a grandkid might be like. this touches my heart. i am so happy for you. Thanks Angella…it’s a pretty sweet time for us right now, so happy you came by. The messiest times, that incredible feeling of overwhelming love, embracing the moment–these things create priceless, never to be forgotten memories. Oh yeah. it’s like falling in love so much that it IS falling in love. I remember when Owen was a baby-baby and I’d put on lipstick before we went to see him. I am not even kidding you. Look at those baby toes. Do you ever worry that you’ll accidentally bite one off? I am not sure why that doesn’t happen all the time. Allene! I agree. Love is best when it’s messy. Love to you and yours…. and happy, happy holidays. I am embracing every moment as I know it will pass all too quickly. I’m right with you, I had my arms around soaking up that sweet warm, and could not stop smelling their heads and necks. I’m so happy for you and that lovely mess. Thanks D. I know what you mean about that smell! It’s intoxicating. If only it could be bottled! Oh so lovely Solstice Baby in these dark days. I have monkey toes too. So does my son and my brother. I think it’s genetic. All these little quirks arriving like presents under the best tree ever. So it seems the best folks have monkey toes! You already have the best gift ever. The Christmas hoopla would be superfluous, don’t you think? 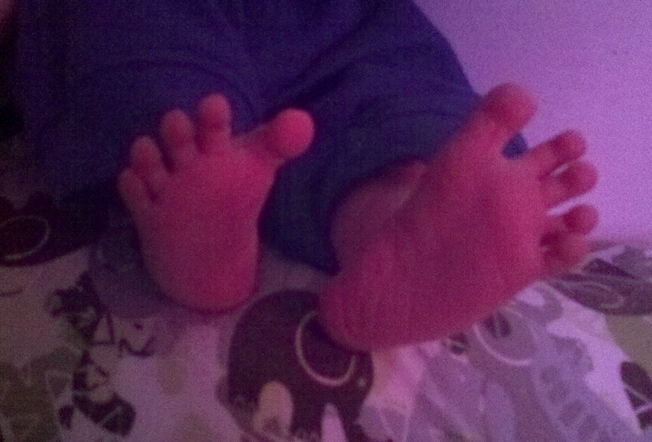 I am missing those baby toes, and wondering how the years flew past me so fast. Enjoy them! For what it’s worth, we’re doing our most scaled back version of Christmas ever, and I’m thinking I can go much leaner than this and still be happy. You are so right Mel….we had the most scaled back Christmas ever this year as well. Purchased one gift!!!! it was great. Monkey Feet Guy makes everything else sort of disappear into a foggy background.